Muiltipurpose theme with powerful options and premium features. Navigate around the demo for a live example. Hear what people like you have to say about Virtue Theme. With Pinnacle you can place the page title background behind your logo and menu making the header area transparent which creates a unique connection with your header and content. Part of the options in pinnacle free is the ability to show your blog in a grid or list format. 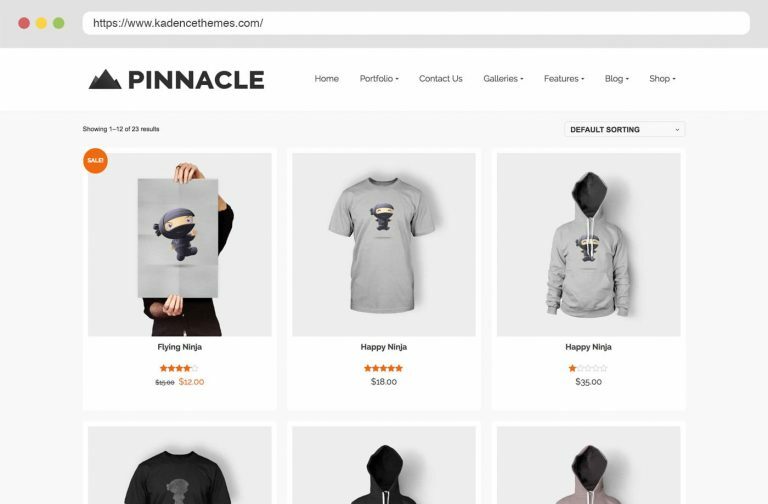 Pinnacle is ready for Woocommerce with its own unique styles to make your stores stand out. 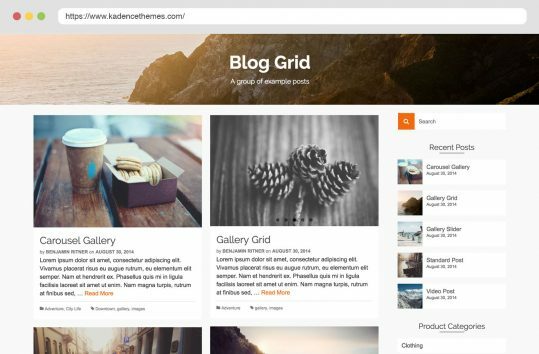 With Pinnacle, you can create awesome portfolio style grids to show off your photography, design or projects. Typography is likely the single most important part of good web design. It can have a huge impact on the feel and style of a site. Being able to set the right sizes, weight, letter-spacing and font family is an important feature. 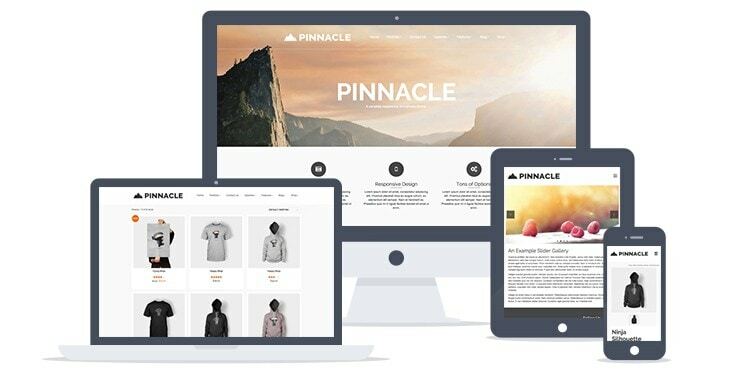 With Pinnacle, you can easily set each area of your site to use a font style that best fits your design. 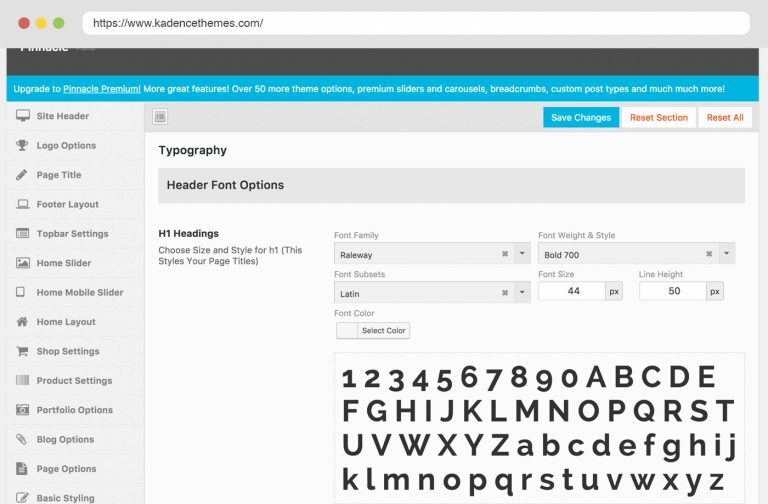 Choose from any of the 800+ available Google fonts. 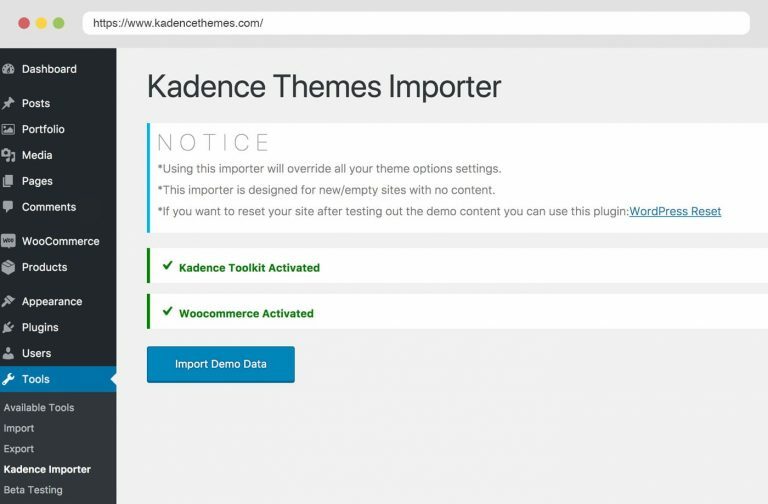 Take hours out of your setup and quickly get started using the one-click Kadence Demo Importer. You get all the content and images you see in the demos and can edit from there. 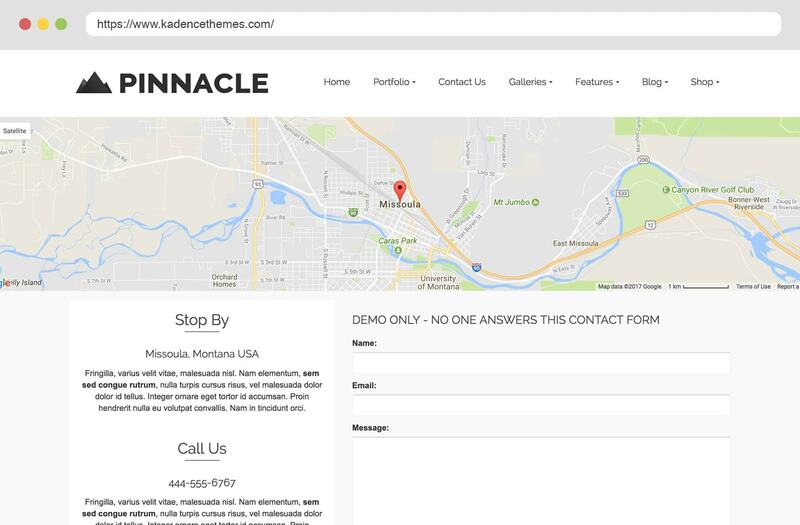 The demo can be easily imported as a starting point for your site using the Kadence Importer plugin. Great work Kadence! Love all your themes! This theme is completely awesome, it's the first WP theme I've ever used and even several months later I'm still learning what all the options can do. I experimented with a few other themes, and their functionality for the free versions was just ridiculously small compared to Pinnacle. It's so lovely, it's perfect for my art and design site, I really love it. Super thème et très beau résultats. Assez facile à utiliser, même pour un "non-expert'. Plein de fonctions très pratiques, même en version gratuite. 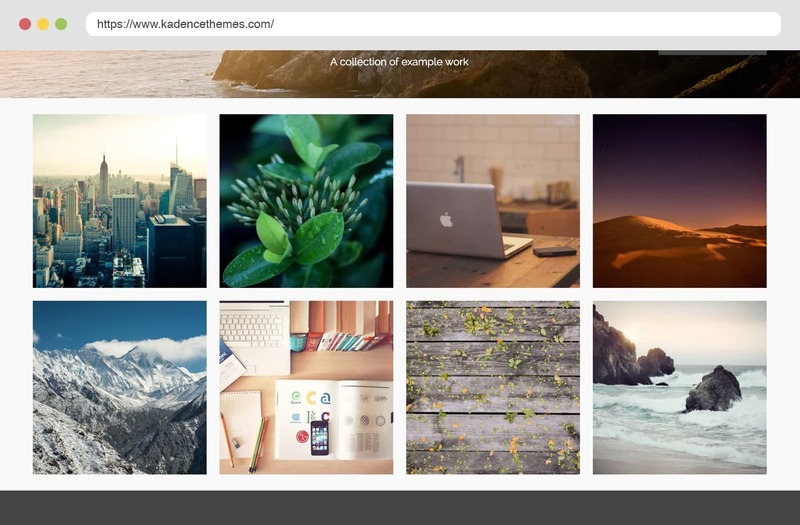 Free Kadence themes are beautifull and very functional. Im using both virtue and pinnacle on 2 sites already by now. Well done. Thank You. I owe You man ! Its a recommended theme from a friend and it is excellent. Thanks so much. it has improved my website tremendously. 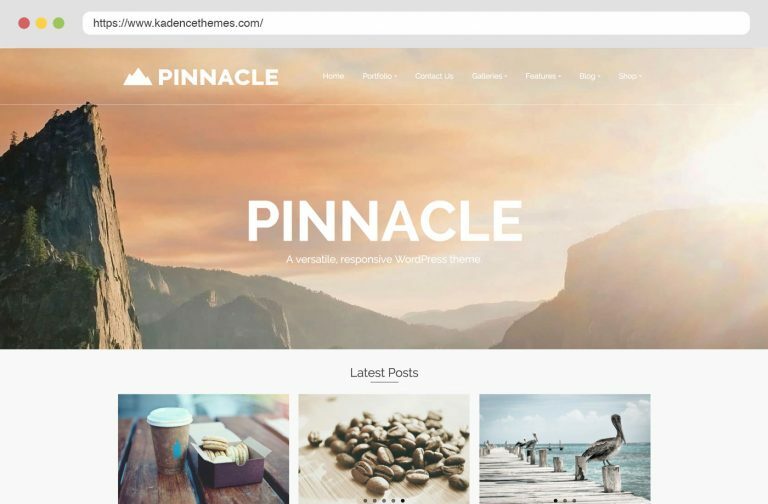 As a newbie to Wordpress, I am thrilled with the free Pinnacle theme. 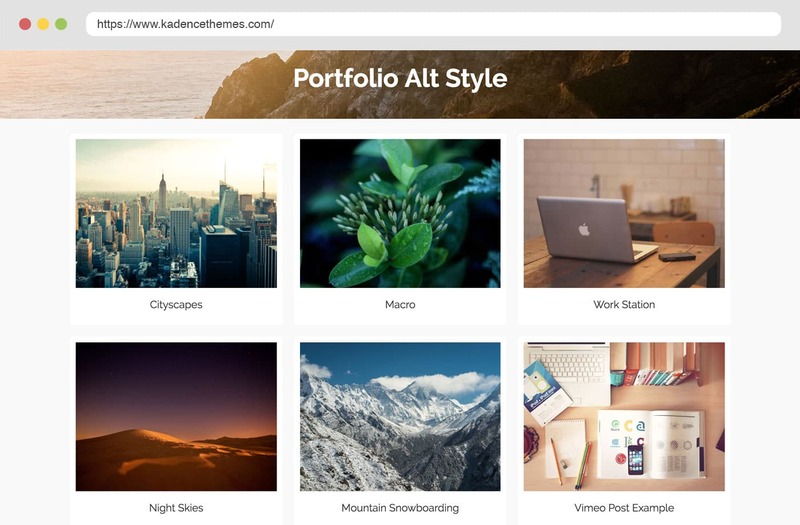 I am learning so much about how things work, what I like, and what quality is, especially after dealing with the numerous other sub-par free themes out there. A great find, great value, and good support. Well done. Infinitely grateful to the guys, great theme! 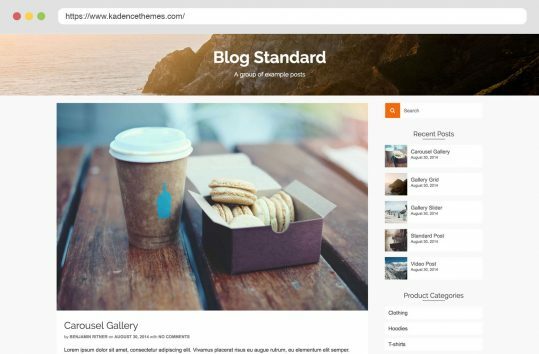 I'm relatively new to wordpress but this is just an awesome theme. Hard to believe it's free, especially given the level of support. Thanks Kadence Themes! It took me a while to find this theme. But it is perfect for the type blog I wanted to create. I am amazed at the quick support response. I'm upgrading to Premium to take advantage of some other widgets it contains. Hey, the price is right! No sé cómo podría ser mejor! Abrumadora cantidad de opciones, calidad, estabilidad, no parece que pudiera ser mejor. No me puedo imaginar cómo será la versión Premium pero tengo planeado obtenerla a corto plazo. Genial y espectacular! Awsome theme! tons of options to customize my site, and a lot more to look into. No problem at all with event calendars and other plugins compatibility, which I had on other themes (not Kadence ones). I wish I had fallen into Pinnacle first! I needed an extra, small configuration and support was great, fast and extreeemely patient. It all worked like a charm. Great work Kadence! Love this theme, so many modification options, it's the best free theme out there. This is even better than virtue theme! Excelente tema con gran cantidad de opciones para personalizar. Great free theme! Good work Kadence! 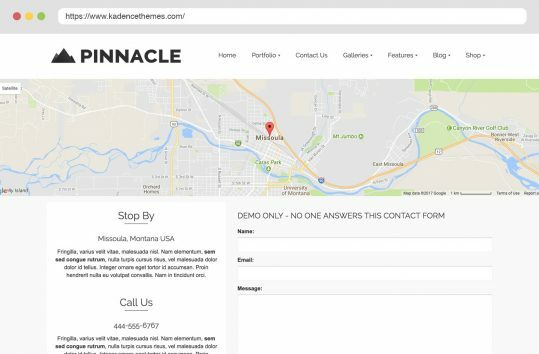 What is the license for Pinnacle, Can I use for my commercial site?